Wow, today is an auspicious day. Not only is June 14, 1940 the day that Nazi troops invaded Paris during World War II, it’s the day that—just six years later—Donald Trump, an exploded goose down pillow bathed in menstrual blood, would invade the United States. 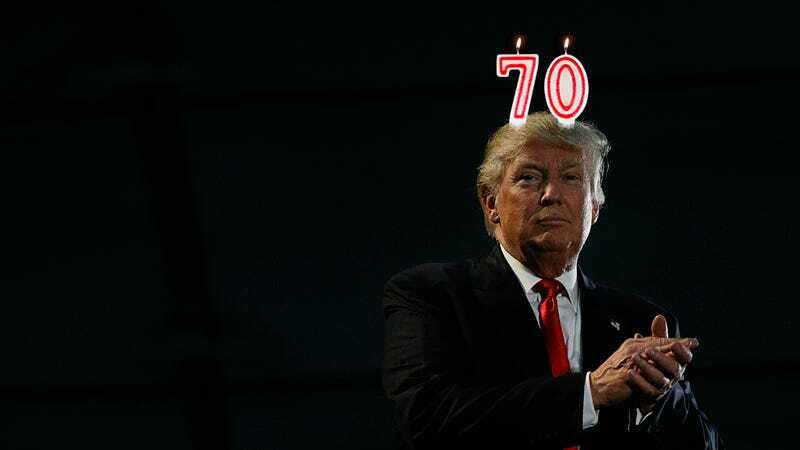 In honor of the man who wants to remove our First Amendment rights, we decided to embrace them wholeheartedly, while we still can, by publishing a list of 70 of Jezebel’s favorite Trump descriptions since the start of 2016. Trump, while you might destroy America as you’ve destroyed essentially every business venture you’ve ever run, you’ve made us examine our own creativity, and realize that the best thesaurus is the thesaurus of the heart.